Black and white negative of a photograph of a glass negative depicting the students of Almonds School in 1907. The schoolhouse is in the background. The teacher, Alice Coakwell, is in the background. The Almonds Town Line School, Union School Section No.1, was located on the north-west corner of Kingston Road at the Whitby-Pickering Town Line. It was destroyed by fire on 4 November 1917 and replaced with another brick school house which was demolished around 1977. 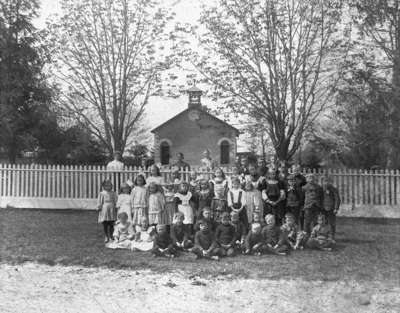 Almonds Townline School Class, 1907, K.M. Clipsham. Whitby Archives 10-012-003. Original glass plate negative held at Pickering Public Library.